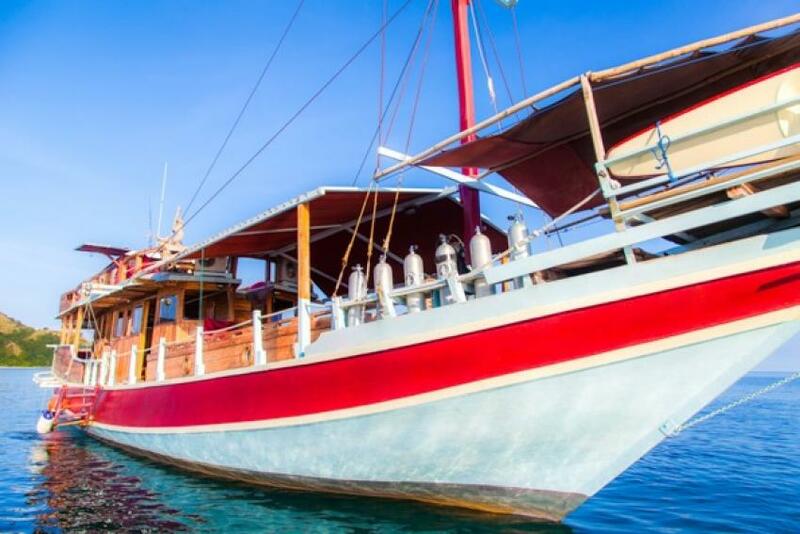 Pratiwi is one of the Ari Dive Fleets boats that offers diving safari at Komodo National Park. Pratiwi Liveaboard can greet on board only 6 divers in 3 cozy and comfortable cabins. All staterooms have double beds and equipped with air conditioning. Boat have small areas with couches, where you can relax after diving. Also, boats vacationers can spend time on the sun deck, under the warm sun. It's perfect to enjoy a gorgeous view of Indonesian blue waters. Dive deck of Pratiwi is small but it’s comfortable for all divers on board to prepare for the dive. Here you store your equipment. Necessary gear for diving also can be rent on board. To ensure your safety on board Pratiwi have all needed facilities required by Indonesian law. Pratiwi is a small boat that suits perfectly for a small company of friends or family. Boat has space for comfortable accommodation of six people. Because of a small capacity boats crew can provide you with personal care. Pratiwi Liveaboards itinerary consists of greatest dive sites around Komodo Island. This destination is known to divers for its great diversity of dive sites. Divers can discover shallow reefs, dive at underwater mountains and walls. Komodo is home for many pelagic fish, barracudas, mantas and stingrays. Of course, it's known for big lizards, Komodo dragons. From Duringthe time from April till November is dry season and this period diving is best at Komodo Island. After November begins a rainy season, but diving is still possible. Just return from the liveaboard from one of the boats of Ari Jaya team. Booked in Ari Jaya but was told that it was being repaired. We were just 3 divers on the boat, making it very exclusive and the service and the food just amazing! Felt good to go out of the water from a dive and have some fried bananas with chocolate to eat :) Me and my wife are experienced travelers & divers and think that the price/quality of the service/dives were adequate. The only thing we think that was not ok and make us feel that this liveaboard was overpriced is the conditions of this old wood boat that needs some remodelation and get rid of some unpleasant insects that made the nights more unconfortable. But this is just almost a detail in this amazing 6 days we were onboard and we are very happy to make this liveaboard with them!